The likes of Robbie Williams, Taylor Swift, Disclosure, Union J and Will.i.am will all perform at London's Wembley Stadium on 9th June. 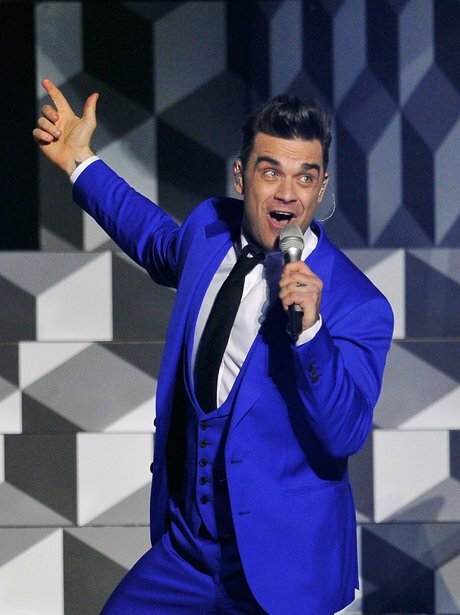 Robbie Williams is among the artists who will perform at the Summertime Ball with Vodafone at Wembley Stadium on 9th June. The former Take That singer has enjoyed a huge return to music in recent years, releasing his album 'Take The Crown', which featured the hit singles 'Candy' and 'Different'. Olly Murs will perform at the Summertime Ball with Vodafone at London's Wembley Stadium on 9th June. The former star of The X Factor's career has gone from strength to strength in recent years, with Olly becoming one of the most successful British stars of his generation - both in the UK and America. Taylor will perform at the Summertime Ball with Vodafone on 9th June at London's Wembley Stadium. The 'We Are Never, Ever Getting Back Together' singer has enjoyed global success during her short career, most recently with the album 'RED'. Get ready for her first major UK show of 2013! The group have been enjoying huge success in America over the last 18 months and are currently preparing to release their new album. The Saturdays will make their return to the Summertime Ball with Vodafone on 9th June at London's Wembley Stadium. The girl group's performance at London's Wembley Stadium for the Summertime Ball follows their recent stint in America, which saw them film a major US TV show Chasing The Saturdays. Jessie will make her third appearance in a row at the Summertime Ball with Vodafone at London's Wembley Stadium on 9th June. Jessie has been busy in recent months recording her much-anticipated second album and has promised that fans will get to hear new music before her appearance at Wembley Stadium in June. Labrinth, come in! Over the last two years, the London rapper and producer has become one of the most influential stars in music and is sure to put on a hit-laden show at the Summertime Ball in June. The 'Anything Could Happen' star released her second album 'Halcyon' last year and is officially one of the most in demand females in pop. Will.i.am will perform at the Summertime Ball with Vodafone at London's Wembley Stadium on 9th June. The Black Eyed Peas rapper recently released his new solo album '#willpower', which featured high profile collaborations with the likes of Justin Bieber, Britney Spears and Nicole Scherzinger. Lawson are among the artists set to perform at the Summertime Ball with Vodafone at London's Wembley Stadium on 9th June. The group shot to fame on The X Factor last year and recently gave their debut single 'Carry You' its world exclusive first play on Capital FM. PSY will perform at the Summertime Ball with Vodafone at Wembley Stadium in London on 9th June. Are there many biggest artists in music at the moment than PSY? The South Korean rapper's 'Gangnam Style' is the most watched music video in history, with over a billion views, while his most recent hit 'Gentleman' is on course to achieving similar success. Disclosure are currently flying high with their new single 'White Noise' featuring AlunaGeorge. Rudimental will perform at the Summertime Ball with Vodafone on 9th June at Wembley Stadium. Rudimental have enjoyed an incredible 12 months with a trio of hit singles, including the John Newman featuring smash hit 'Feel The Love'. AlunaGeorge will perform at the Summertime Ball with Vodafone on 9th June at Wembley Stadium. AlunaGeorge are officially one of the hottest dance duo's in electronic music, with standout hits including 'Attracting Flies'. Charlie Brown will perform at Summertime Ball with Vodafone at London's Wembley Stadium on 9th June. 'One My Way' to Wembley Stadium in June, it's Charlie Brown! Rizzle Kicks will perform at the Summertime Ball with Vodafone at London's Wembley Stadium on 9th June. The 'Mama Do The Hump' stars have been working on new material in recent months - will this year's Ball be the occasion they choose to debut it? Loveable Rogues will perform at the Summertime Ball with Vodafone at London's Wembley Stadium on 9th June. Loveable Rogues shot to fame on Britain's Got Talent and are currently flying high with their single 'What A Night'. James Arthur will perform at the Summertime Ball with Vodafone on 9th June at London's Wembley Stadium. The X Factor winner has been working hard on his debut album in recent months and will be one of the most-anticipated artists on stage at Wembley. Duke Dumont will perform at the Summertime Ball with Vodafone at London's Wembley Stadium on 9th June. Duke Dumont recently hit the number one spot on the Vodafone Big Top 40 with 'Need U (100%)' featuring A*M*E.
Naughty Boy will perform at this summer's event following his number one on the Vodafone Big Top 40 with 'La La La' featuring Sam Smith.